Have you ever wondered what famous artists, actors and actresses do to have such beautiful teeth and smiles? How do they look so natural? We recently welcomed a patient who’s main concern was how to have a better smile. She is 37 years old, and she was born with a maxillofacial dysfunction. She didn’t want to summit herself into surgery where the oral surgeon had to cut her upper jaw 3 mm from one side to make her smile look even. She went through orthodontics procedures for so many years, hoping that her smile would improve. Of course, braces help her a lot, her bite was corrected, but her smile was never good enough. She started to do some research. 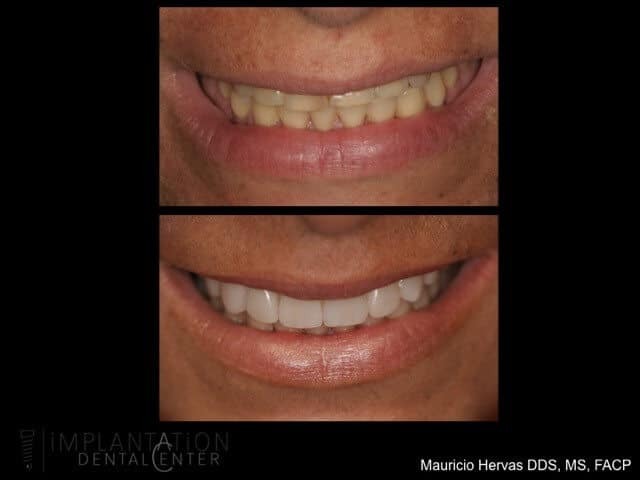 And that’s how she found Dr. Mauricio Hervas at Implantation Dental Center, the only dental clinic in Plantation, South Florida with the equipment and the expertise to solve her issue and make her smile with confidence for the rest of her life. On my first visit to Implantation Dental Center the treatment plan was presented after a long conversation with Dr. Hervas. He explained to me what I was going to have done. They took impressions on me to study my case and for them to elaborate my provisional teeth. On my second appointment I have ready my provisional teeth. Dr. Hervas started preparing my teeth. I did not feel any pain. Of course he had to numbed me. It took maybe 2 hours from molar to molar. I was really nervous to see what the end was going to be. When he finished he put the provisionals on me. I just couldn’t believe what I saw. I started crying of full happiness. I was a totally different person (Dr. Hervas said, wait don’t get to excited leave some for your final veneers). I thought if I look like this with my provisionals… my veneers are going to make me feel even more grateful. I had to wear my provisionals for 2 weeks. Of course I had to be very extra careful on what to eat. I didn’t want to have the risk of cracking them, not only because of the sensitivity that I could feel but also because I didn’t want people noticing that I have grinded my teeth. About two weeks later I went back to my final appointment. I was ready to see my “final art”. The picture lets the result speak for itself. 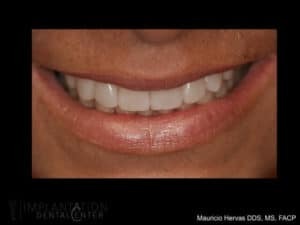 I asked Dr. Hervas to take a picture of my before and after, I knew this is something that I wanted to share with the world. I then realized how important is to research and find the right doctor. Somebody how truly understands not only my dental needs but also to understand human psychology. He knew that was going to change my life. Make me feel more beautiful and confident. 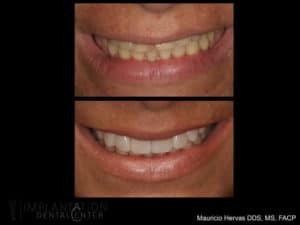 For me, more than dental veneers… is the brightness of a new beautiful smile! Cosmetic Dentistry – What are the Options? Previous POST:-What is a dental abscess? Next POST:-What is a temporomandibular disorder? Or well known as TMJ?